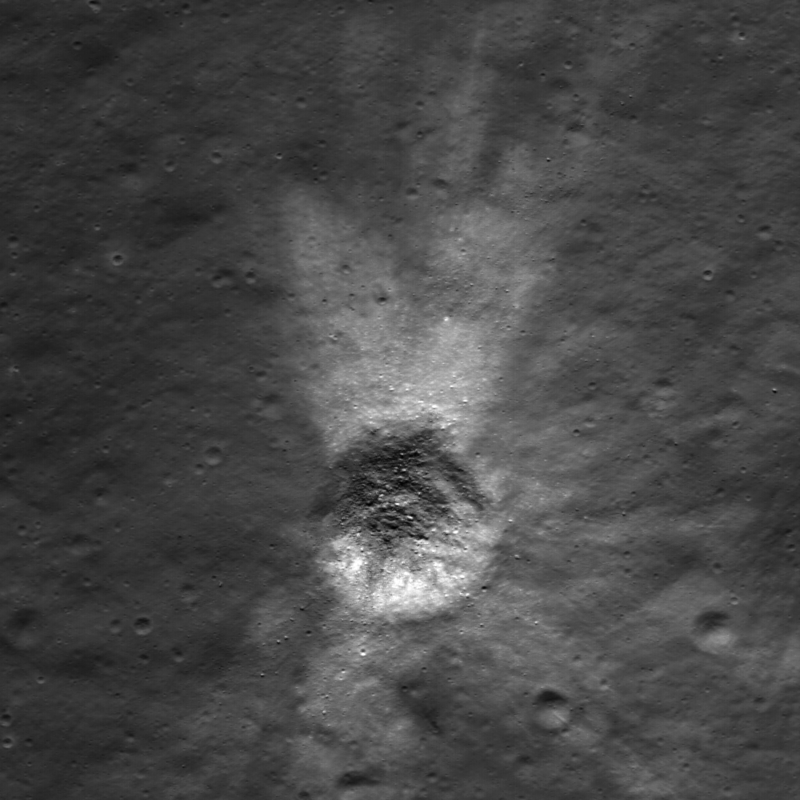 High-albedo marks on the lunar surface left by a boulder bouncing down the northeast wall of farside highlands crater Moore F. Image width is 610 meters [NASA/GSFC/Arizona State University]. 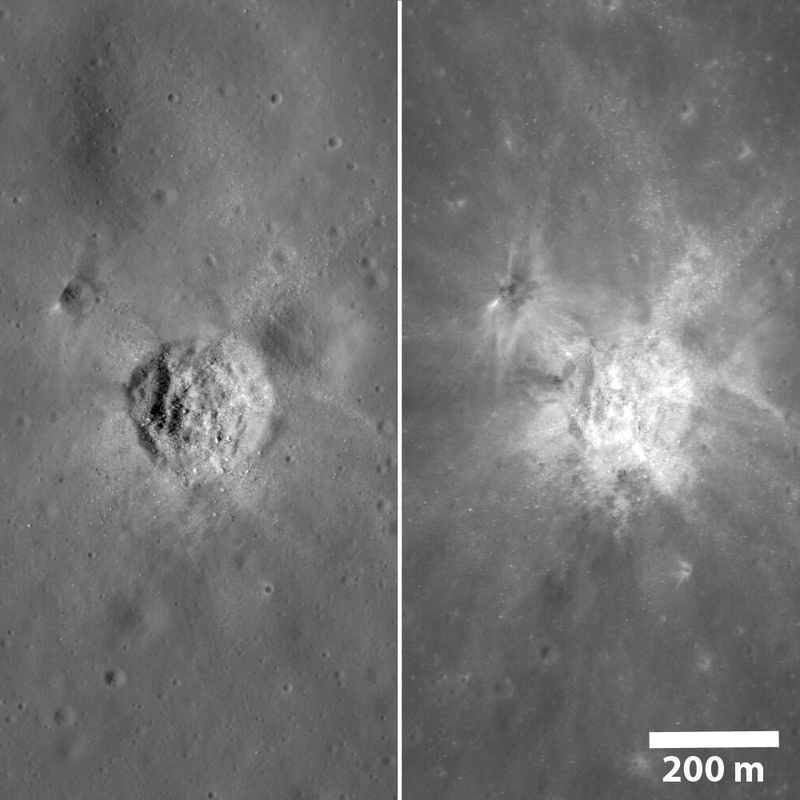 Same crater from two LROC NAC frames under very different lighting. On the left the Sun was midway to the horizon and on the right the Sun was high, approaching noon. Under lower Sun, surface roughness is quite evident; under higher sun (right) variations in brightness (reflectance) dominate the scene [NASA/GSFC/Arizona State University]. Fresh crater on the southwest rim of Metius B crater. 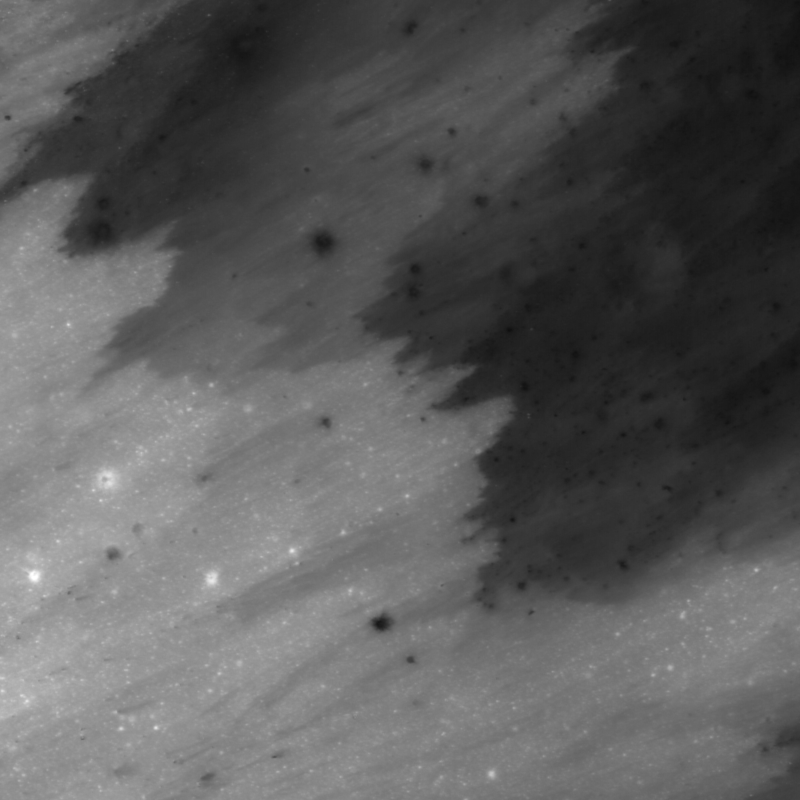 LROC NAC image width is 740 meters [NASA/GSFC/Arizona State University]. 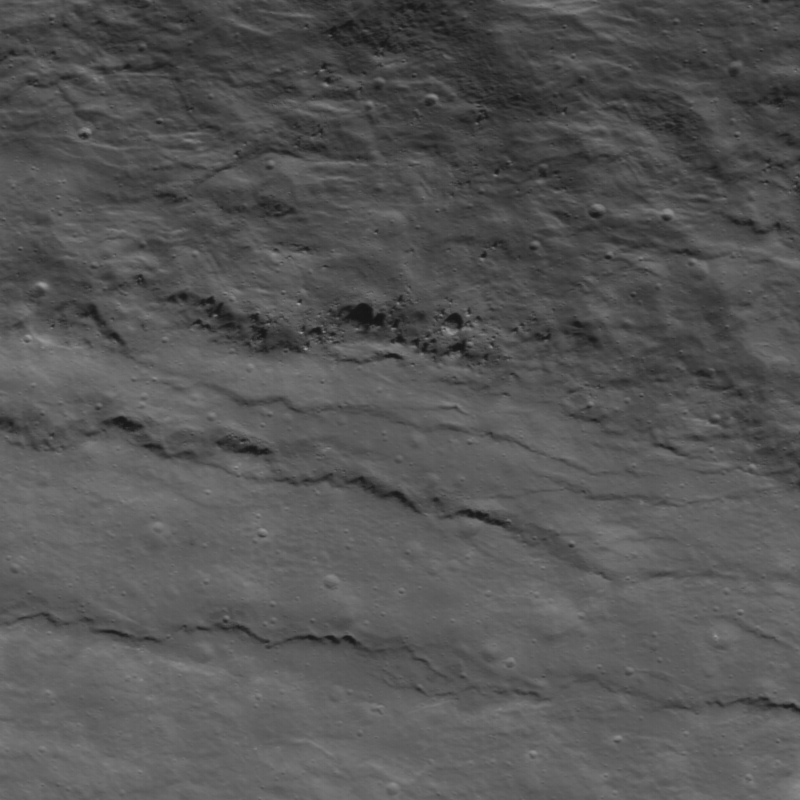 The fresh, well-preserved rim of Slipher S. Uncalibrated LROC NAC data; image width is 600 meters [NASA/GSFC/Arizona State University]. 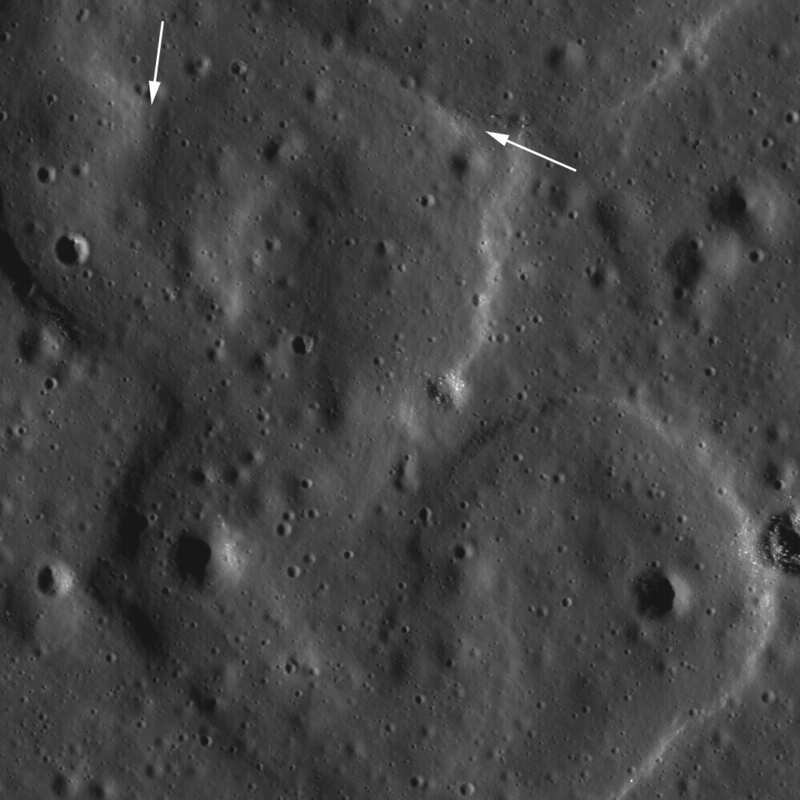 Many boulder trails are found on the lunar crater walls and basin massifs. Some of the trails are smooth and nearly straight while others are curvy or gouge into the surface. In many cases by following a boulder's trail you are led back to its point of origin, useful information for a future geologist sampling otherwise unreachable points. Image width is 600-m across, north is up, and the boulder in the lower left-hand corner is 15-m across, unnamed 15-km diamater crater southwest of Rowland crater [NASA/GSFC/Arizona State University]. 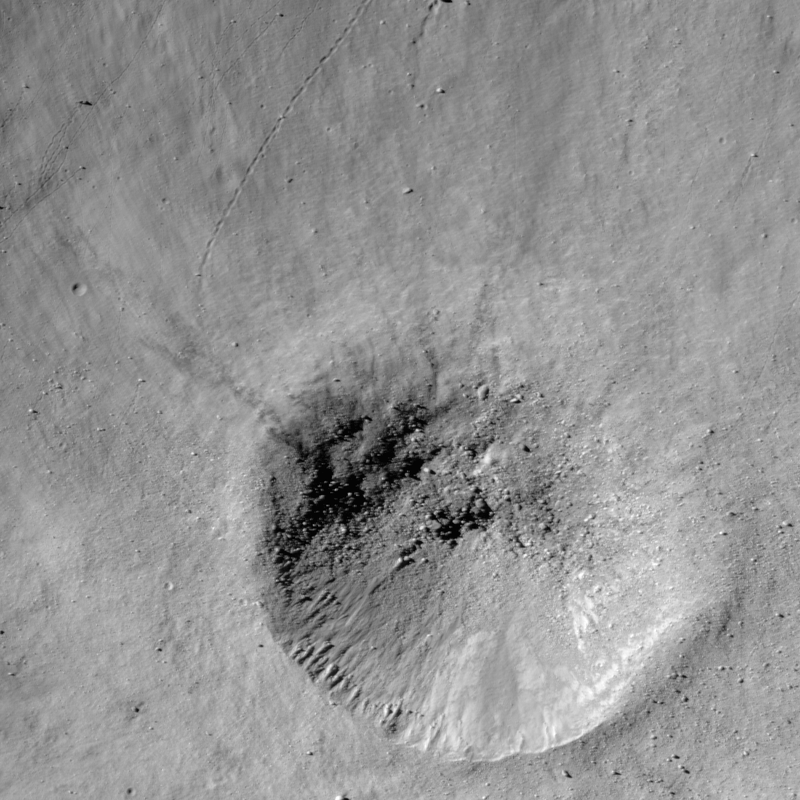 Distinctive asymmetrical ejecta surrounding a 140 meter diameter crater in the lunar highlands. 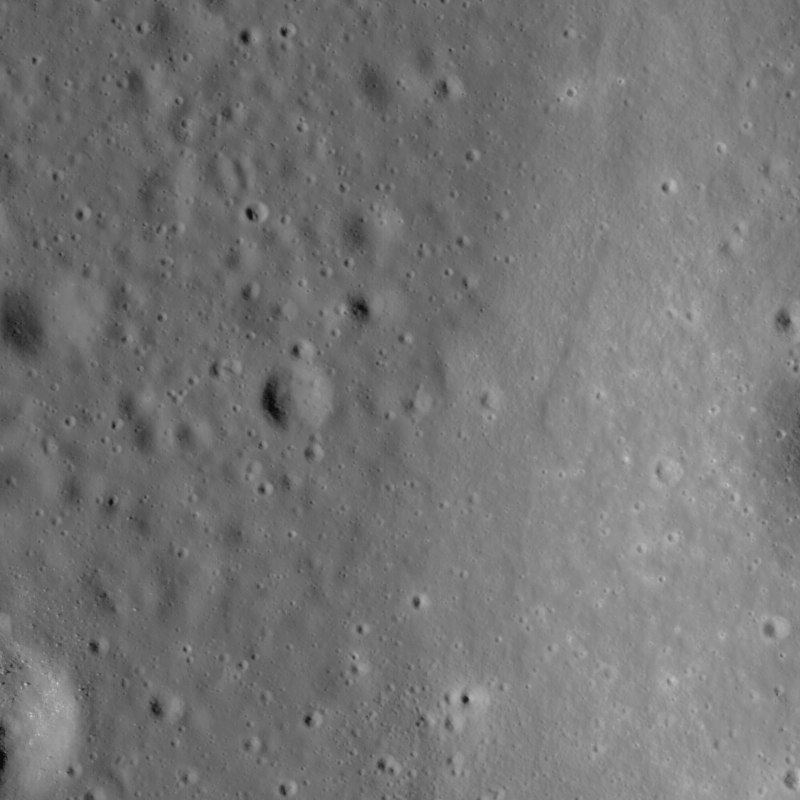 Crater is located on the northeastern rim of the eroded (pre-Nectarian) crater Hommel at -52.9° N and 34.6° E. Image width is 600 meters and north is up, 0.6 m/pixel resolution [NASA/GSFC/Arizona State University]. 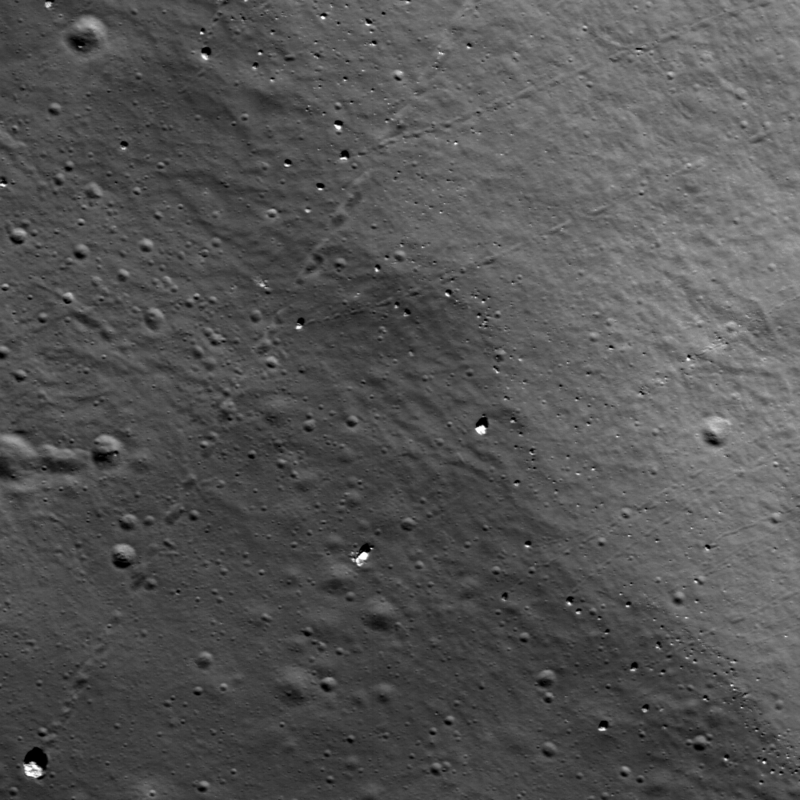 Crater (center of image) formed by impact of the Apollo 14 Saturn IVB booster. 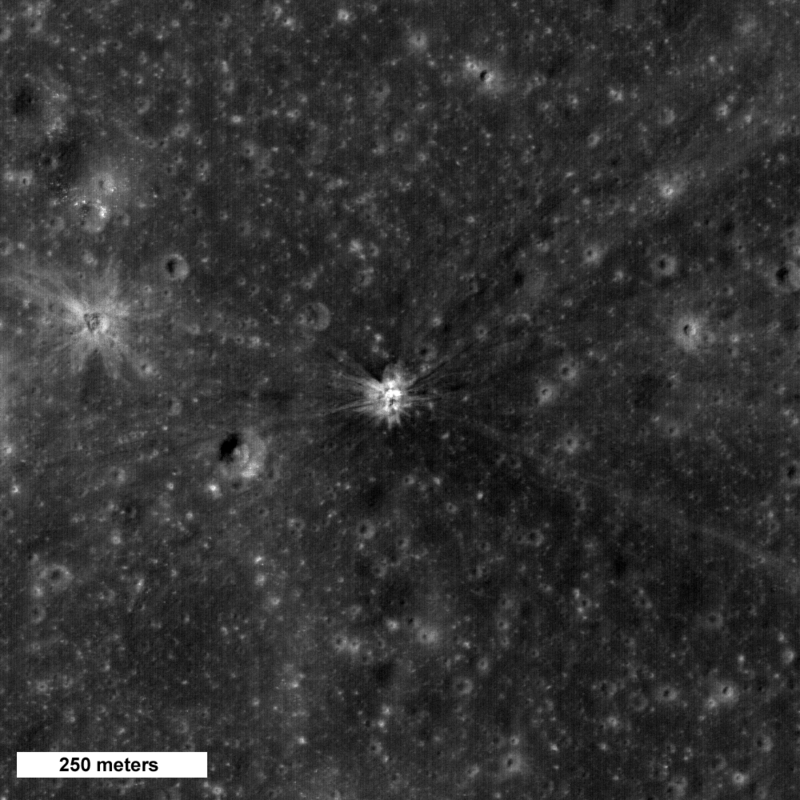 The booster was intentionally impacted into the lunar surface on February 4, 1971 to serve as an energy source to probe the interior structure of the Moon using seismometers placed on the surface by Apollo astronauts [NASA/GSFC/Arizona State University]. Two oxbow bends along the length of a sinuous rille located on a mare-filled crater floor. The tight twists and turns of the rille suggest that a very turbulent lava flow formed this rille. Subarea of uncalibrated LROC NAC frame M102672335L; image width is 1.56 km across and north is up [NASA/GSFC/Arizona State University]. 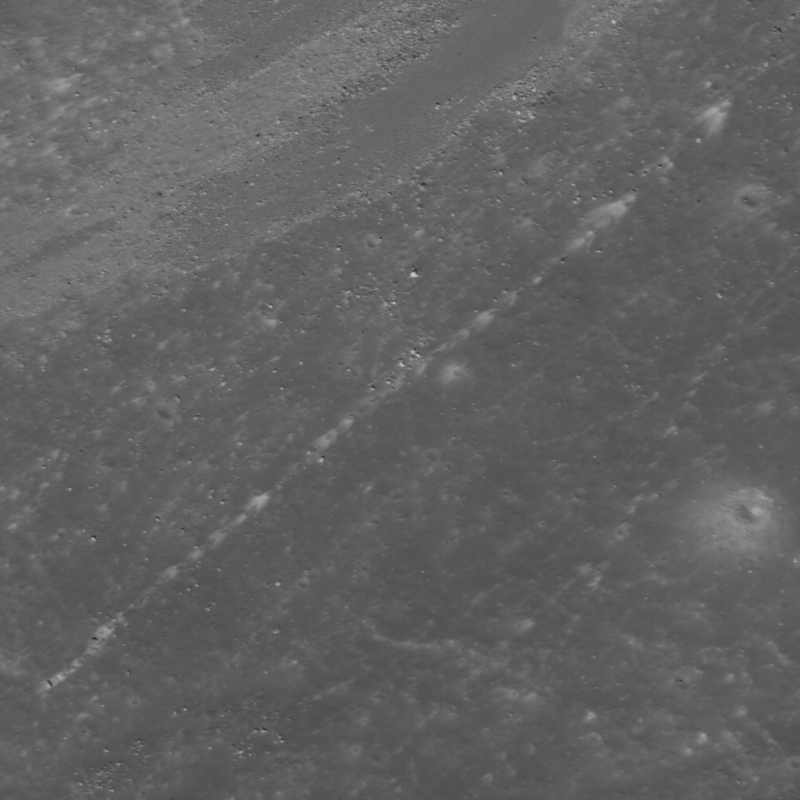 The edge of Mare Moscoviense. Image width is 1.4 km [NASA/GSFC/Arizona State University].